Part of the confusion regarding GNS theory comes from its abstract (if not occasionally weird) terminology and unclear definitions. In the following, we will try to substitute the terms Gamism, Narrativism and Simulationism with the more readily understood player priorities Success, Immersion and Creativity (note that there has been a change in order to make for a better acronym). 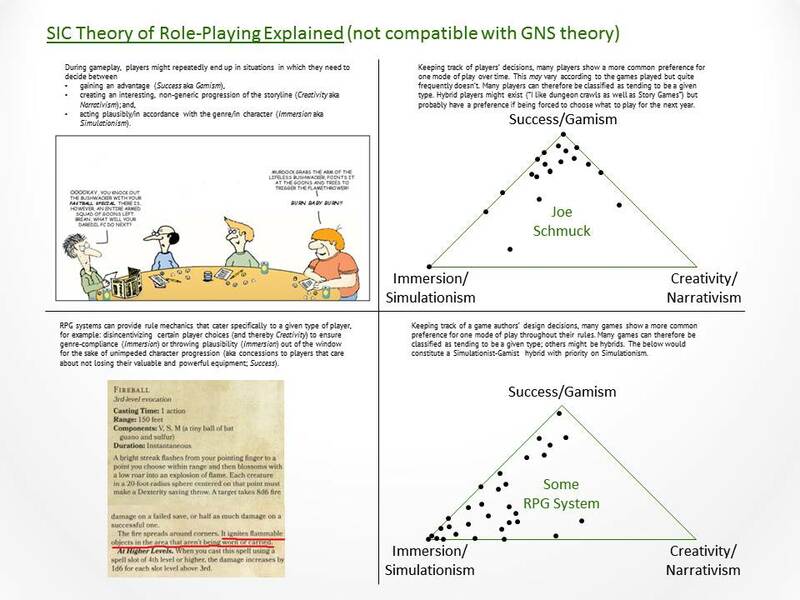 Success (Gamism): The GNS creator, Ron Edwards, defines Gamism in terms of challenge – both to the players as well as their characters. While the Knights of the Black Lily RPG addresses this through its revolutionary concept of challenge-driven design, we contend that players not only want to be challenged and see their characters being challenged; they want to be challenged and prevail. We conclude therefore that some players care about winning (whatever that may mean in a given context) more than they care about realism or genre faithfulness or exciting emergent story-telling. They want to beat that master villain or they want to build the strongest PC or they want to face difficult situations and master them with the right decisions or whatever else may drive them. It’s about victory in some form for them, ultimately. Immersion (Simulationism): Conversely, what GNS refers to as Simulationism does not concern itself with real world aspects. It’s all about getting lost in the role, in the other world. It’s about getting lost in that other. Various aspects like the setting or personalities can take the spotlight, depending on each game, but whatever the case, it’s all about diving into the fiction. From a game design standpoint, it’s all about avoiding immersion-breaking mechanics and capturing the spirit of thing you’re trying to recreate. Plausibility and realism are often key. Creativity (Narrativism): Finally, narrativism. What do systems touted as story-driven such as The Pool, Powered by the Apocalypse or FATE have in common with a mechanic like Fantasy Flight Games’ Narrative Dice? They enable spontaneous creativity at the game table. Most commonly, narrativist give players limited agency over the game world beyond making decisions on behalf of their characters. The appeal of what GNS calls narrativism, namely emergent story-telling, is just that: creativity. It’s no coincidence that the role of the GM is more frequently redefined here than in other modes: when things are more about collaborative creativity, a single person of central authority is not necessarily needed. So, in essence, SIC theory is merely a renaming and reframing (short term instead of overarching goals) of the modes of play/Creative Agendas postulated by GNS theory before. Enjoy!